Empty contents of cherry drink mix envelopes into 6- to 8-oz. container. Add 2 Tbsp. water; stir until mixes are completely dissolved. Repeat in 3 additional containers with remaining drink mixes and water. Place eggs on cooling rack in sink; rinse with tap water. 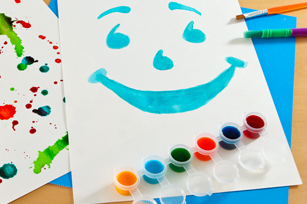 Spoon Kool-Aid mixtures, 1 at a time, over wet eggs to create tie-dye patterns. Pour small amount of additional water over each egg to set colors. Use tongs to transfer eggs to paper towel-covered baking sheet; let stand until dried. Rinse sink immediately as needed. 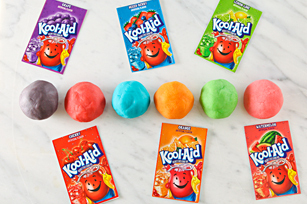 Pour Contents Of 1 Envelope Of Each Flavor Kool-aid Drink Mix Into Separate 10- To-12 Oz. Container. Add 2/3 Cup Water To Each; Stir To Dissolve Drink Mix. Use Spoon To Place 1 Hard-cooked Egg In Each Cup, Keeping Egg Submerged Until Desired Color Is Reached. Continue With Remaining Eggs. Let Dry As Directed In Recipe. Place Assorted Rubber Bands Around Hard-cooked Eggs Before Dipping In Cups Of Kool-aid Mixtures; Let Dry Completely Before Removing Rubber Bands. 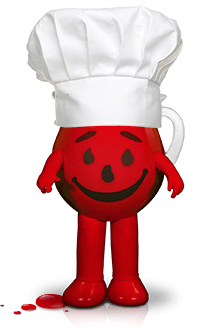 For A Two-tone Effect, Dip The Dry Colored Eggs Again In A Lighter-colored Prepared Kool-aid. 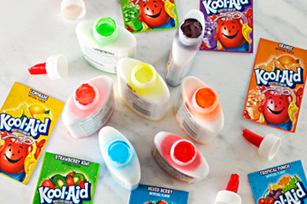 Experiment With Other Kool-aid Flavors For Different Color Patterns. Use Black Cherry, Strawberry Or Tropical Punch For Red; Mango Or Peach Mango For Orange; Or Lemon-lime Or Piña For Yellow. 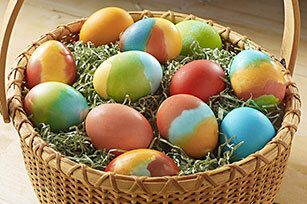 Wear Disposable Gloves When Coloring The Eggs To Prevent Your Hands From Becoming Discolored.